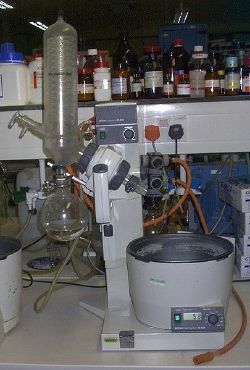 A simple distillation apparatus used in a laboratory. 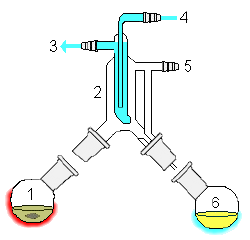 1: Heat source 2: Still pot 3: Still head 4: Thermometer/Boiling point temperature 5: Condenser 6: Cooling water in 7: Cooling water out 8: Distillate/receiving flask 9: Vacuum/gas inlet 10: Still receiver 11: Heat control 12: Stirrer speed control 13: Stirrer/heat plate 14: Heating (Oil/sand) bath 15: Stirrer bar/anti-bumping granules 16: Cooling bath. Distillation is a method of separating chemical substances based on differences in their volatilities. It usually forms part of a larger chemical process, and is thus referred to as a unit operation. 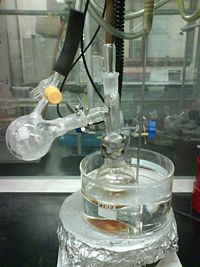 Distillation is used for a variety of purposes. Water is distilled to remove impurities—for example, to remove salt from seawater. Air is distilled to separate its components, such as oxygen, which is used for medical applications, and helium, used for party balloons. The distillation of crude oil produces fractions useful for specific purposes such as transport, power generation, and heating. The use of distillation on fermented solutions to produce distilled beverages with a higher alcohol content is perhaps the oldest form of distillation, known since ancient times. 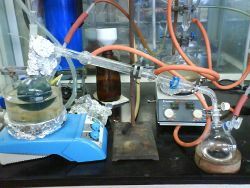 Distillation using a retort (the flask on the left). Distillation was developed into its modern form with the invention of the alembic by Islamic alchemist Jabir ibn Hayyan in around 800 C.E. He is also credited with the invention of numerous other chemical apparatus and processes that are still in use today. The design of the alembic has served as an inspiration for some modern micro-scale distillation apparatus such as the Hickman stillhead. As alchemy evolved into the science of chemistry, vessels called retorts became used for distillations. Both alembics and retorts are forms of glassware with long necks pointing to the side at a downward angle which act as air-cooled condensers to condense the distillate and let it drip downward for collection. Later, copper alembics were invented. Riveted joints were often kept tight by using various mixtures, for instance a dough made of rye flour. These alembics often featured a cooling system around the beak, using cold water for instance, which made the condensation of alcohol more efficient. These were called pot stills. Today, the retorts and pot stills have been largely supplanted by more efficient distillation methods in most industrial processes. However, the pot still is still widely used for the elaboration of some fine alcohols, such as cognac and Scotch whisky. The unique shape of each pot still is said to give the alcohol a distinctive taste. Pot stills made of various materials (wood, clay, stainless steel) are also used by bootleggers in various countries. Small pot stills are also sold for the domestic production of flower water or essential oils. The application of distillation can roughly be divided in four groups: laboratory scale, industrial distillation, distillation of herbs for perfumery and medicinals (herbal distillate) and food processing. The latter two are distinct from the former two, in that in the distillation is not used as a true purification method, but more to transfer all volatiles from the source materials to the distillate. In continuous distillation, the source materials, vapors and distillate are kept at a constant composition by carefully replenishing the source material and removing fractions from both vapor and liquid in the system. This results in a better control of the separation process. It is a common misconception that in a solution, each component boils at its normal boiling point - the vapors of each component will collect separately and purely. This, however, does not occur even in an idealized system. Idealized models of distillation are essentially governed by Raoult's law and Dalton's law. Raoult's law assumes that a component contributes to the total vapor pressure of the mixture in proportion to its percentage of the mixture and its vapor pressure when pure. If one component changes another component's vapor pressure, or if the volatility of a component is dependent on its percentage in the mixture, the law will fail. Dalton's law states that the total vapor pressure is the sum of the vapor pressures of each individual component in the mixture. When a multi-component system is heated, the vapor pressure of each component will rise, thus causing the total vapor pressure to rise. When the total vapor pressure reaches the ambient pressure, boiling occurs and liquid turns to gas throughout the bulk of the solution. Note that a given mixture has one boiling point, when the components are mutually soluble. The idealized model is accurate in the case of chemically similar liquids, such as benzene and toluene. In other cases, severe deviations from Raoult's law and Dalton's law are observed, most famously in the mixture of ethanol and water. These compounds, when heated together, form an azeotrope, in which the boiling temperature of the mixture is lower than the boiling temperature of each separate liquid. Virtually all liquids, when mixed and heated, will display azeotropic behavior. Although there are computational methods that can be used to estimate the behavior of a mixture of arbitrary components, the only way to obtain accurate vapor-liquid equilibrium data is by measurement. It is not possible to completely purify a mixture of components by distillation, as this would require each component in the mixture to have a zero partial pressure. If ultra-pure products are the goal, then further chemical separation must be applied. In continuous distillation, the process is different from the above in that fractions are withdrawn from both the vapor and the liquid at such a speed that the combined ratio of the two fractions is exactly the same as the ratio in the starting mixture. In this way a stream of enriched component A and a stream of enriched component B is obtained. Moreover, a stream of crude mixture (which has the same ratio of A and B as the mixture in the still) can be added to the distilling mixture to replenish the liquid, meaning that the system can be run continuously. 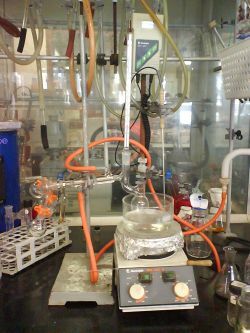 Both batch and continuous distillations can be improved by making use of a fractionating column on top of the distillation flask. The column improves separation by providing a larger surface area for the vapor and condensate to come into contact. This helps it remain at equilibrium for as long as possible. The column can even exist of small subsystems ('dishes') which all contain an enriched, boiling liquid mixture, all with their own vapor phase. Laboratory scale distillations are almost exclusively run as batch distillations. The device used in distillation, sometimes referred to as a still, consists at a minimum of a reboiler or pot in which the source material is heated, a condenser in which the heated vapor is cooled back to the liquid state, and a receiver in which the concentrated or purified liquid, called the distillate, is collected. Several laboratory scale techniques for distillation exist (see also distillation types). In simple distillation, all the hot vapors produced are immediately channeled into a condenser which cools and condenses the vapors. 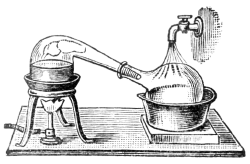 Thus, the distillate will not be pure - its composition will be identical to the composition of the vapors at the given temperature and pressure, and can be computed from Raoult's law. For many cases, the boiling points of the components in the mixture will be sufficiently close that Raoult's law must be taken into consideration. Thus, fractional distillation must be used in order to separate the components well by repeated vaporization-condensation cycles within a packed fractionating column. Dimethylsulfoxide usually boils at 189 °C. Under a vacuum, it distills off into the receiver at only 70 °C. The Perkin triangle has means via a series of glass or teflon taps to allow fractions to be isolated from the rest of the still, without the main body of the distillation being removed from either the vacuum or heat source, and thus can remain in a state of reflux. To do this, the sample is first isolated from the vacuum by means of the taps, the vacuum over the sample is then replaced with an inert gas (such as nitrogen or argon) and can then be stoppered and removed. A fresh collection vessel can then be added to the system, evacuated and linked back into the distillation system via the taps to collect a second fraction, and so on, until all fractions have been collected. Interactions between the components of the solution create properties unique to the solution, as most processes entail nonideal mixtures, where Raoult's law does not hold. Such interactions can result in a constant-boiling azeotrope which behaves as if it were a pure compound (i.e., boils at a single temperature instead of a range). At an azeotrope, the solution contains the given component in the same proportion as the vapor, so that evaporation does not change the purity, and distillation does not effect separation. For example, ethyl alcohol and water form an azeotrope of 95 percent at 78.2 °C. If the azeotrope is not considered sufficiently pure for use, there exist some techniques to break the azeotrope to give a pure distillate. This set of techniques are known as azeotropic distillation. Some techniques achieve this by "jumping" over the azeotropic composition (by adding an additional component to create a new azeotrope, or by varying the pressure). Others work by chemically or physically remove or sequester the impurity. For example, to purify ethanol beyond 95 percent, a drying agent or a desiccant such as potassium carbonate can be added to convert the soluble water into insoluble water of crystallization. Molecular sieves are often used for this purpose as well. 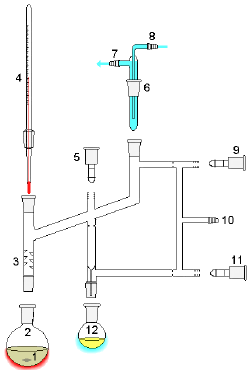 Short path distillation is a distillation technique that involves the distillate traveling a short distance, often only a few centimeters. 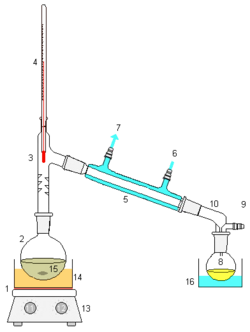 A classic example would be a distillation involving the distillate traveling from one glass bulb to another, without the need for a condenser separating the two chambers. This technique is often used for compounds which are unstable at high temperatures. Advantages are that the temperature of the boiling liquid does not have to be much higher than the boiling point of the distilling substance, and the gases only have to travel a short distance while in the gas-phase before they can be cooled again to a lower temperature. Destructive distillation involves the strong heating of solids (often organic material) in the absence of oxygen (to prevent combustion) to evaporate various high-boiling liquids, as well as thermolysis products. The gases evolved are cooled and condensed as in normal distillation. The destructive distillation of wood to give methanol is the root of its common name - wood alcohol. Dry distillation, despite its name, is not truly distillation, but rather a chemical reaction known as pyrolysis in which solid substances are heated in a strongly reducing atmosphere and any volatile fractions are collected. Flash evaporation (or partial evaporation) is the partial vaporization that occurs when a saturated liquid stream undergoes a reduction in pressure by passing through a throttling valve or other throttling device. This process is one of the simplest unit operations. Freeze distillation is an analogous method of purification using freezing instead of evaporation. It is not truly distillation, and does not produce products equivalent to distillation. This process is used in the production of ice beer and ice wine to increase ethanol and sugar content, respectively. 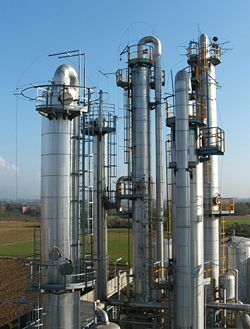 Industrial distillation is typically performed in large, vertical cylindrical columns known as distillation towers or distillation columns with diameters ranging from about 65 centimeters to 6 meters and heights ranging from about 6 meters to 60 meters or more. When the process feed has a diverse composition, as in distilling crude oil, liquid outlets at intervals up the column allow for the withdrawal of different fractions or products having different boiling points or boiling ranges. The "lightest" products (those with the lowest boiling point) exit from the top of the columns and the "heaviest" products (those with the highest boiling point) exit from the bottom of the column and are often called the bottoms. Large-scale industrial towers use reflux to achieve a more complete separation of products. 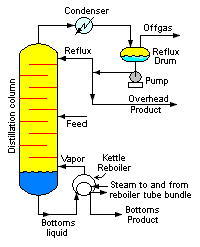 Reflux refers to the portion of the condensed overhead liquid product from a distillation or fractionation tower that is returned to the upper part of the tower as shown in the schematic diagram of a typical, large-scale industrial distillation tower. Inside the tower, the downflowing reflux liquid provides cooling and condensation of the upflowing vapors thereby increasing the efficacy of the distillation tower. The more reflux is provided for a given number of theoretical plates, the better is the tower's separation of lower boiling materials from higher boiling materials. Alternatively, the more reflux is provided for a given desired separation, the fewer theoretical plates are required. Design and operation of a distillation tower depends on the feed and desired products. Given a simple, binary component feed, analytical methods such as the McCabe-Thiele method  or the Fenske equation  can be used. For a multi-component feed, simulation models are used both for design and operation. Moreover, the efficiencies of the vapor-liquid contact devices (referred to as "plates" or "trays") used in distillation towers are typically lower than that of a theoretical 100 percent efficient equilibrium stage. Hence, a distillation tower needs more trays than the number of theoretical vapor-liquid equilibrium stages. In industrial uses, sometimes a packing material is used in the column instead of trays, especially when low pressure drops across the column are required, as when operating under vacuum. This packing material can either be random dumped packing (1-3" wide) such as Raschig rings or structured sheet metal. Liquids tend to wet the surface of the packing and the vapors pass across this wetted surface, where mass transfer takes place. Unlike conventional tray distillation in which every tray represents a separate point of vapor-liquid equilibrium, the vapor-liquid equilibrium curve in a packed column is continuous. However, when modeling packed columns, it is useful to compute a number of "theoretical stages" to denote the separation efficiency of the packed column with respect to more traditional trays. Differently shaped packings have different surface areas and void space between packings. Both of these factors affect packing performance. Carbohydrate-containing plant materials are allowed to ferment, producing a dilute solution of ethanol in the process. Spirits such as whiskey and rum are prepared by distilling these dilute solutions of ethanol. Other components than ethanol are collected in the condensate, including water, esters, and other alcohols which account for the flavor of the beverage. ↑ Microscale Laboratory Techniques - Distillation from McMaster University. Retrieved January 29, 2019. ↑ Sealing Technique, Iberian Coppers S.A. Retrieved January 29, 2019. ↑ Traditional Alembic Pot Still The Essential Oil Company. Retrieved January 29, 2019. ↑ Separation of liquid - liquid mixtures (solutions) IUPAC. Retrieved January 29, 2018. ↑ Distillation. The Wired Chemist. Retrieved January 29, 2019. ↑ Spinning Band Distillation B/R Instrument Corporation. Retrieved January 29, 2019. ↑ Henry Z. Kister, Distillation Design (New York: McGraw-Hill, 1992, ISBN 0070349096). ↑ 8.0 8.1 8.2 Robert H. Perry and Don W. Green, Perry's Chemical Engineers' Handbook, 6th Edition (McGraw-Hill, 1984, ISBN 0070494797). ↑ J. D. Seader and Ernest J. Henley, Separation Process Principles (New York: Wiley, 1998, ISBN 0471586269). This page was last modified on 29 January 2019, at 16:16.